The application is open until November 10, 2016. In this Topical Workshop, it is planned to bring together mathematical physicists who are specialized in mathematical aspects of quantum field theory, quantum gravity, and string theory. The workshop will focus on four intertwined pillars: locality and observables, symmetry and duality, string compactifications, and numbers and singularities. 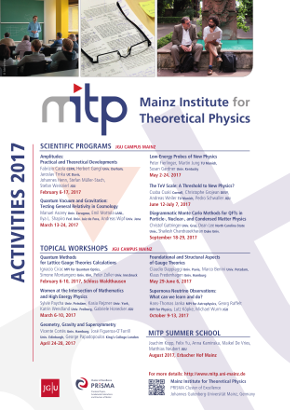 Besides providing an opportunity to exchange knowledge at the frontier between theoretical high energy physics and mathematics, this Topical Workshop will bring together a still underrepresented minority of excellent women, with the aim to foster equal opportunities by networking and improving their visibility within the scientific community.